Onnoghen’s seeming crisis of honour and lack of self-respect has led to the degeneration of this matter into a full blown constitutional crisis. Other not-too-palatable decisions have been made by the executive arm of government, but an honourable self-recusal by Onnoghen could have tempered the storm and minimised the backlash. The Watergate scandal of 1972 in the United States of America gave rise to the adoption of the “-gate” suffix now used to depict scandals of every type. The way it works in Nigeria is that the suffix is added to the subject matter of the scandal or to the name of the individual or group at the centre of the scandal, as in the very recent Adeosungate. Now, there is a fresh and ongoing scandal at the highest level of the country’s judiciary, but the heroes and villains are difficult to tell apart. Where does the smear of scandal fall in the ongoing drama between the Presidency and the now suspended(?) 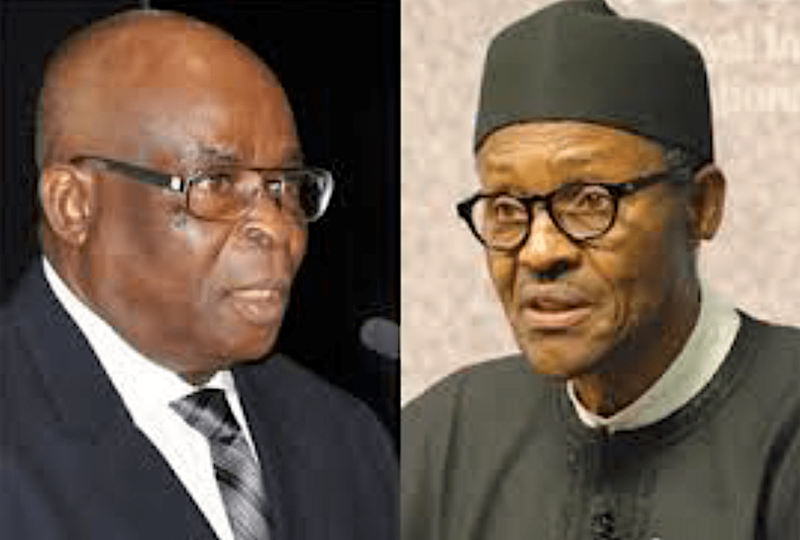 chief justice of Nigeria (CJN), Justice Walter Onnoghen? When news suddenly got out that the CJN would be arraigned for offences related to non-declaration of assets, there were mixed reactions from Nigerians. There was dismay in the South-South, irritation in the legal community and bewilderment in the wider society. Tied to the different emotions was the knowledge of the looming elections, just over two weeks away now. Facts quickly emerged about the speed of development in the case, from the submission of petition to the filing before the Code of Conduct Tribunal (CCT). Then the lawyers injected some more controversy about the legality of the procedure and constitutional arguments erupted. While this was going on, the CJN’S bank accounts were published publicly. The CJN’s battalion of lawyers and Senior Advocates of Nigeria (SANs) objected to the CCT’s jurisdiction by filing cases in other courts. They filed several applications for discontinuation of the CCT case, including one that led to an order from the Court of Appeal to stay the proceedings. However, President Muhammadu Buhari, in an address on Friday, suspended the CJN on the strength of an order granted by the CCT, naming Justice Tanko Mohammed as the Acting CJN. There was widespread rejection of this move by most of the notable legal practitioners in the country, thereby compounding the debate on the legality of the Code of Conduct Bureau heading straight to the CCT in the first place. Given the sensitive timing of the prosecution and the blurry legality of the process adopted, the international community has also expressed concerns. Thus, what could have easily become another anti-corruption victory for the Buhari administration has turned into a constitutional crisis, and the possible shame of a CJN is being overshadowed by what appears to be his persecution, against the spirit of the law and in disrespect of its procedures. Like in many of the country’s affairs, bad management of this issue has escalated an already sensitive matter into a national emergency. In what appears to be a passive protest at the development, other judges of the Supreme Court did not attend the swearing in of the members of the Election Tribunal for next month’s elections. Only one of the Supreme Court judges attended the ceremony conducted by the acting CJN. With his administration’s record of disregarding court orders, and other procedural oversights, the nation will find it difficult to accept President Buhari’s reliance on the one court order that should not have been followed. His decision may help to strengthen the theories about ulterior motives for the move against Onnoghen at this time. Meanwhile, the Nigerian intelligentsia is caught between a genuine desire to see corrupt officials exposed, tried and removed and anger at the seeming disregard for legal procedure, which would have ensured the rule of law in this matter. For others, it appears like an ethnic affront or an audacious political gambit calculated to influence the judiciary in the aftermath of the elections. This cacophony of emotions and the posture of the judiciary at this time is the last thing we need in the run in to elections. The National Assembly is also poised to weigh in on the matter. The Constitution assigns the Senate a role in the removal of a CJN, which is where this is headed. Legally speaking, the Constitution is silent about the exact procedure and power to suspend a sitting CJN. However, it gives the National Judicial Council (NJC) power over the discipline of judicial officers. This strengthens the argument of the CJN’s lawyers who have relied on a Court of Appeal decision in Nganjiwa v FRN to claim that all questions of misconduct against a judicial officer should be referred first to the NJC, which was not done in this case. Some others have cited a provision in the Interpretation Act that purportedly allows the president to exercise the power of suspension against the CJN, in the silence of the Constitution on that particular matter. As only a competent court of law can decide this issue, one would think that the body language of the judiciary should guide the Presidency in this matter. As for Onnoghen, the game may be up for him. There appears to be no scenario where he would happily return to serve as CJN until retirement. Even a successful defence of the allegations against him may still not remove the moral obligation on him to step down from his tainted office as the CJN. Had he done the honourable thing at the beginning by stepping aside to face the allegations, he probably would now have the benefit of doubt and the safety of the judicial system to ensure fair hearing. Onnoghen’s seeming crisis of honour and lack of self-respect has led to the degeneration of this matter into a full blown constitutional crisis. Other not-too-palatable decisions have been made by the executive arm of government, but an honourable self-recusal by Onnoghen could have tempered the storm and minimised the backlash. With his administration’s record of disregarding court orders, and other procedural oversights, the nation will find it difficult to accept President Buhari’s reliance on the one court order that should not have been followed. His decision may help to strengthen the theories about ulterior motives for the move against Onnoghen at this time. In any case, even if the law had been followed to the letter and the NJC’s go-ahead had somehow been obtained to prosecute the CJN, bringing it at this time would have still been met with suspicion and criticism, casting negative light on the coming elections, as has now happened. The bulk of the criticism should go to the president’s advisers, including the attorney-general, Abubakar Malami; the chairman of the Presidential Advisory Council on Anti-Corruption, Professor Itse Sagay; and the vice president, Yemi Osinbajo, a Senior Advocate, who was probably on a “toilet break” when the decision on Onnoghen was made. In the end, this is not a matter of gates. It is a constitutional crisis, bordered by disappointing ethnic issues and good old national distrust. There is still an unflattering leeway out of this: for the Presidency to admit it’s indelicate handling of the matter and revert to the NJC. With Donald Trump’s pandering to his far right core support base and Theresa May’s obstinate mission for a hard Brexit (even with the very close Brexit referendum result), it appears true statesmanship and compromise in politics has been lost with the times. In Nigeria, President Buhari’s anti-corruption fight, which is allegedly checkered by politics, seems to be poised to consume his government. It is a damn-all-consequences crusade that lacks the delicate touch that, thankless as it may be, must be applied in a society such as ours. For the sake of peace, a quiet and private audience with the CJN, intimating him of the findings against him, with irrefutable evidence, could have induced a voluntary resignation, in return for the protection of his dignity. The president’s advisers, whether it be the so-called cabal we keep hearing of or some other rabble rousers in his inner circle, may have goaded him on this path that may affect his chances at the oncoming election. It can also potentially lead to more undesirable consequences that could have been avoided. The Presidency may have made an unpopular move to satisfy a popular hunger. With the CCT case now adjourned indefinitely, post-suspension, this week will be revealing on the next chapter of this saga, and one fears it is far from over. In the end, this is not a matter of gates. It is a constitutional crisis, bordered by disappointing ethnic issues and good old national distrust. There is still an unflattering leeway out of this: for the Presidency to admit it’s indelicate handling of the matter and revert to the NJC. The CJN also still has the opportunity to muster some courage and accept his suspension or reaffirm it by announcing his own desire to stand aside to vindicate himself or accept punishment.